UPDATED: Roberts launches its first colour touchscreen radio | What Hi-Fi? Roberts Radio has announced the colourSTREAM DAB/FM/internet radio complete with a touchscreen colour display and an iPod dock. The radio is the company's first with a colour touchscreen display and comes in a high gloss piano black finish. As well as the normal array of stations you can stream music directly from your computer, while a listen again button allows you to access recorded programmes. Also on board is a Last.fm widget that will recommend music based on your listening habits and allow you listen to new music. There's a stereo line output, headphone socket, an auxiliary input for connecting another music source and playback of digital files over USB. The Roberts colourSTREAM is due out now for £200. Further details have emerged of Roberts' new Expression DAB/FM radio, on sale now for a penny under £100. The Expression has curved "ash-effect" wooden edges with a metal grille on the front and back. Simple rotary controls and a favourites button are positioned under the handle, and there's a headphone input and a line-in socket for connecting an iPod or other MP3 player. Software can be upgraded via the standard USB socket. Power comes from the mains or four D-size batteries (rechargeable battery optional). It may still be August, but that hasn't stopped Roberts Radio revamping virtually its entire line-up in preparation for the Christmas season. New models being prepared for this Yuletide include the Expression (£100), described as "the perfect gift for today's contemporary home, while still evoking a retro feel". Quite. It has has a built-in battery charger and can run for up to 100 hours on a single charge. For those who prefer the more tradtional, and familiar, Roberts Revival but with a modern twist, there's a new version with wi-fi internet radio alongside DAB and FM. The Revival iStream has a black leather finish and costs £200. Meanwhile, the existing Revival DAB/FM model comes in five new colours: Leaf, Cocoa, Duck Egg, Casis and Saffron. And you get gold-plated fittings too. Lovely. If a plain colour doesn't suffice, there'll be a new Cath Kidston-inspired Candy Flowers Revival radio, again for £200. The ecologic range is expanded to include the £90 ecologic 7, with 150 hour battery life, as we've already reported. And the Stream series is boosted with the Stream 205 with wi-fi in addition to DAB and FM (£130). The radio comes with a 30-day free trial of Last FM, which recommends the music that it thinks you might like depending on what you're listening to. 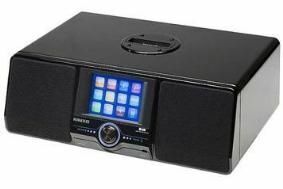 The Stream 63i is a DAB/FM/CD/USB/wi-fi and iPod dock music system housed in an acoustically tuned wooden cabinet finished in gloss black. It will go on sale in December for £350. Also in the pipeline is the ColourStream with touchscreen interface and the facility to handle apps. One gives direct access to Last FM, and other apps are on the way. It's possible Spotify could be added in due course.